Alice Independence: What's for Dinner tonight? 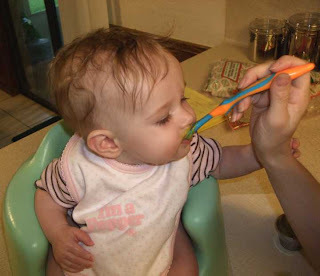 Last time Aunt Sissy was here to visit Alice..she pre-made some avocado baby food. 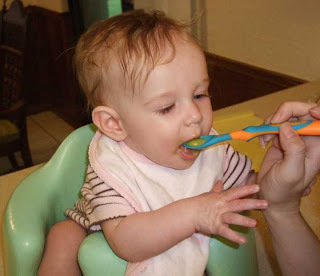 This week, Alice tried the avocado's for the first time - and LOVED it! She really never got excited about the rice cereal....oh....it was fun to spit it out and get it all over the place, but we were never sure if she actually ATE any of it. 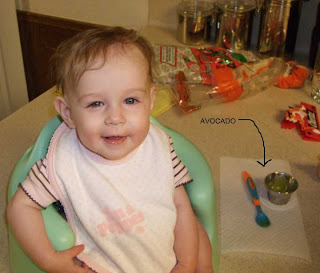 But, with the avocados, we could really tell she was eating it. More in her mouth, and less on her. YEAH ALICE, she's becoming such a big girl!